The impact of Hurricane Katrina in 20051 on health care infrastructures abruptly clarified the need for and value of “anytime, anywhere” access to health information by health care providers during disasters. The development of Health Information Exchanges (HIEs) to meet that need has faced and continues to face technical, business, and adaptive challenges in creating sustainable child health information systems. Key issues in HIE development for child health are the inclusion of pediatric-specific data and guardian-related privacy/security issues. As HIE developers address these issues in designing regional information systems, experts in both child health and informatics must be included in the planning and implementation to achieve successful development, diffusion, and sustainability of HIEs. AHIMA e-HIM Workgroup on HIM in Health Information Exchange. Health Information Management (HIM) Principles in Health Information Exchange. J AHIMA. 2007;78(8) (September 2007): online version for members only. Available at: http://www.ahima.org/hie/index.asp. Accessed December 21, 2008.
e-Health Initiative. Fourth (and fifth) Annual Survey of Health Information Exchange at the State, Regional and Community Levels; 2007, 2008. Available at: http://www.ehealthinitia-tive.org/HIESurvey/2007Survey.mspx. Accessed December 21, 2008. Walker J et al. The Value of Health Care Information Exchange and Interoperability. Health Affairs; 2005: Supplement 24: 10–18. Available at: http://content.healthaffairs.org/cgi/content/full/hlthaff.w5.10/DC1. Accessed December 21, 2008. Markle Foundation, American Medical Association, Gold Standard, RxHub, SureScripts Lessons from KatrinaHealth; 2006: 15–18. Available at: http://www.markle.org/downloadable_ assets/katrinahealth.final.pdf.Accessed December 21, 2008. National Alliance for Health Information Technology (NAHIT). Press release: NAHIT Releases HIT Definitions; 2008. Available at: http://www.nahit.org/pandc/press/pr5_20_2008_1_33_49. asp. Accessed December 21, 2008. US Department of Health and Human Services Office of the National Coordinator for Health Information Technology. Goals of Strategic Framework; 2004. Available at: http://www.hhs. gov/healthit/goals.html. Accessed December 21, 2008.
e-Health Initiative. Improving the Quality of Healthcare Through Health Information Exchange; 2006. Available at: http://toolkits.ehealthinitiative.org/assets/Documents/eHI-2006HIESurveyReportFinal09.25.06.pdf. Accessed December 21, 2008. State-level HIE. Reports; 2008. Available at: http://www.slhie.org/reports.asp. Accessed December 21, 2008. Basch P. Data Excess and Document Overload: Barriers and Disincentives to an Interconnected / Interoperable Healthcare System” in Connecting for Health: A Public Private Collaborative, edited by The Data Standards Working Group; 2003: 90. Available at: http://www.connectingforhealth.org/resources/dswg_report.pdf Accessed December 21, 2008. Healthcare Management Council, Inc (HMC). Medication Reconciliation. HMC Wiki: Collaboration for Hospital Performance Improvement; 2008. Available at: http://wiki. hmccentral.com/index.php/Medication_reconciliation. Accessed December 21, 2008. Burt CW, Hing E, Woodwell D, Centers for Disease Control. Electronic Medical Record Use by Office-Based Physicians: United States, 2005; 2008. Available at: http://www.cdc. gov/nchs/products/pubs/pubd/hestats/electronic/electronic.htm. Accessed December 21, 2008. American Academy of Pediatrics Council on Clinical Information Technology (COCIT). COCIT Website. Available at: http://www.aap.org/visit/medinfo.htm. Accessed August 1, 2008. 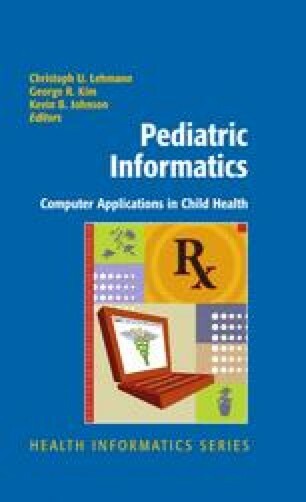 American Academy of Pediatrics Council on Clinical Information Technology. Electronic Medical Record (EMR) Review Project Website. Available at: http://www.aapcocit.org/emr/. Accessed August 1, 2008. ASTM International. ASTM E1714 - 07 Standard Guide for Properties of a Universal Healthcare Identifier (UHID); 2007. Available at: http://www.astm.org/Standards/E1714.htm. Accessed December 21, 2008. Department of Health and Human Services. National Plan and Provider Enumeration System Website; 2008. Available at: https://nppes.cms.hhs.gov/NPPES/NPIRegistryHome.do. Accessed December 21, 2008.